I found this to be a difficult gallery to put together - not for lack of pictures, but for the difficulty of choosing which ones to include. 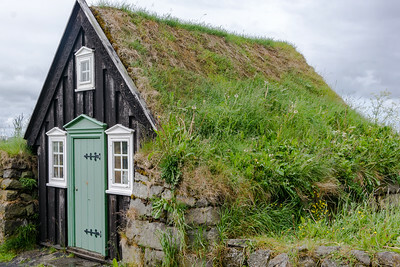 Of the places visited on this trip, Iceland is the one place I want to go back to so I wanted to provide a sense of why I feel that way. But the landscape often looks bleak and uninteresting. Yet I found the country fascinating because of, or in spite of that. 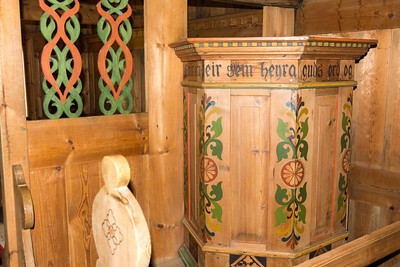 We were told that any trees we saw were planted or reproduced from trees that were planted. 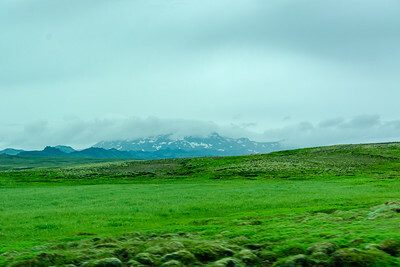 We were told that there are no fossils in Iceland and that there is no heavy layer of topsoil. 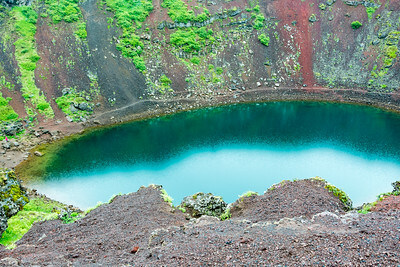 The reason for this is that Iceland, geologically speaking, is too young to have fossils and the lava fields have not had time to break down into soil. As a result, the landscape is very different from what we had seen elsewhere and therein lies my interest. 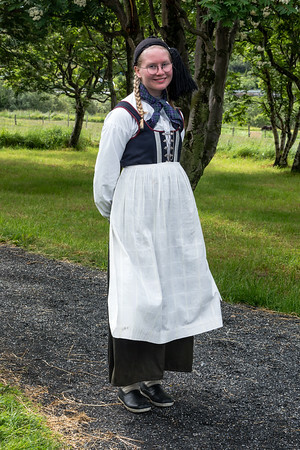 So the things that we saw in this land settled by the Vikings were not what we had seen in Europe or North America. I do want to return - we had a very short several days and saw only a bit of the southern area of the country. 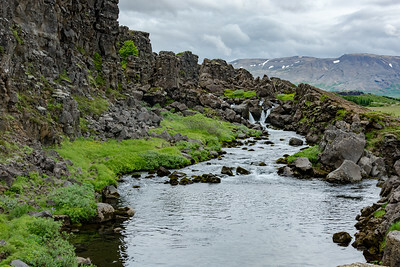 Most of the greenery outside of the city is moss - deep, soft moss - on top of lava fields. 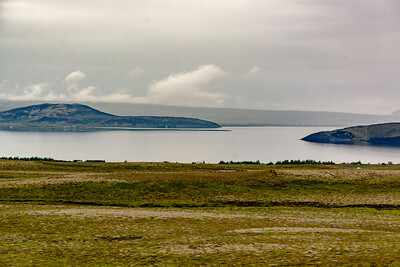 In the Geysir hot springs area. 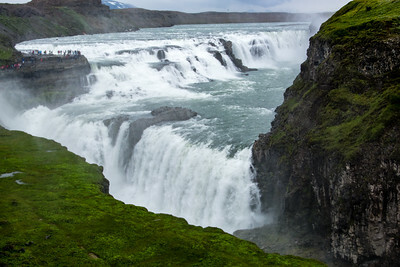 This geyser erupts every 4 to 8 minutes to a height of 15 to 20 meters. 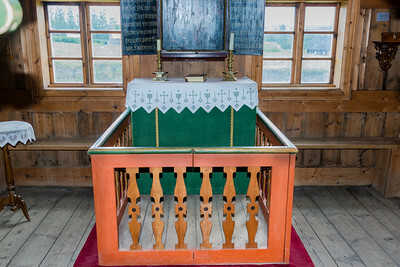 The church in the museum is very small and can be rented for weddings or other events. The land appears to be barren with no trees or wildlife. Most animals seen roaming around are goats from the farms. 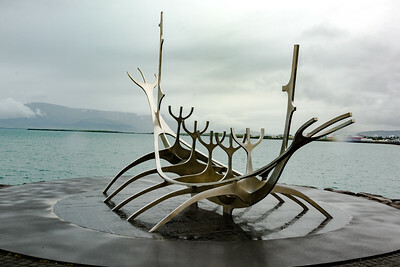 A stylized sculpture of a Viking ship located on the waterfront in the harbour. 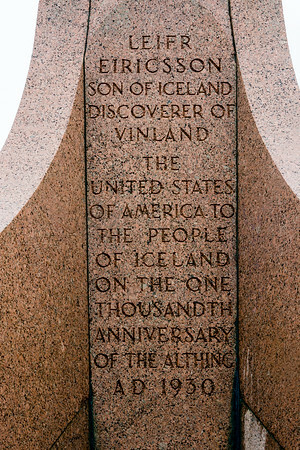 Of great historical and geological importance. The 3 white buildings mark the location of the oldest existing parliament in the world, first assembled in 930 A.D. The valley seen here is a rift valley. 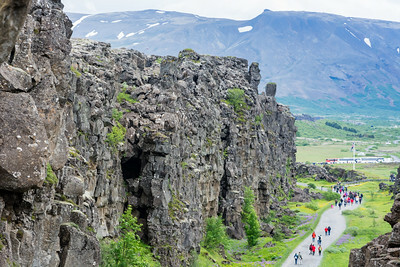 Due to widespread volcanic activity (Iceland being a young country) lava is a common ground base. 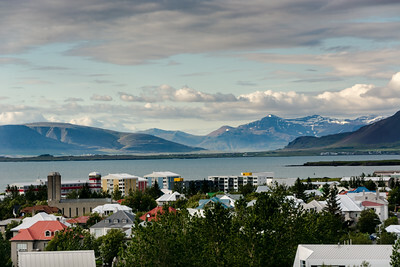 The main landmark in Reykjavik which can be seen from almost everywhere in the city. 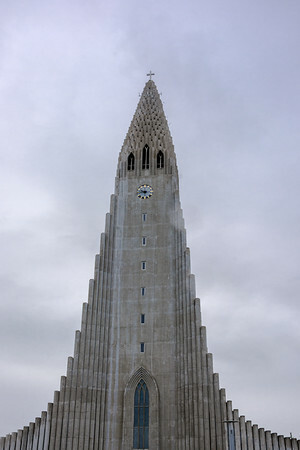 It is the largest church in Iceland. 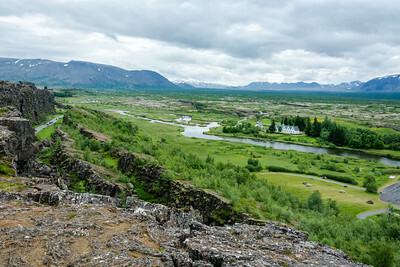 On the west side of the valley seen in the previous picture is the edge of tectonic plate of North America, The Euroasian plate is on the east side of the valley. These plates drift apart at the rate of about 3 inches a year. 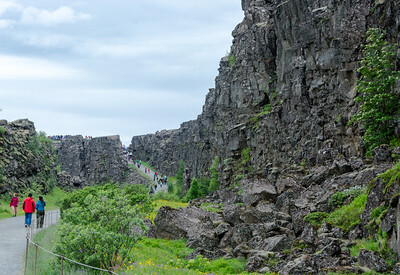 To get a sense of size, there is a woman in a red coat on the left side. A floating stage is sometimes built on the water for concerts. The acoustics are supposed to be excellent. 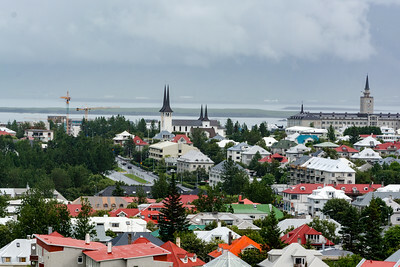 The Pearl is a dome shaped structure situated on a height of land which provides a panoramic view of Reykjavik. 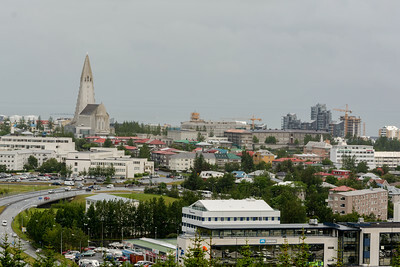 This view looks towards the downtown area and the harbour. 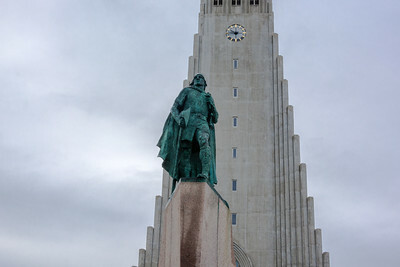 The stature of the Viking stands outside the church. 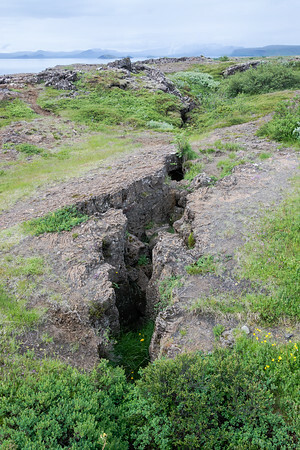 Large cracks are a common sight in the ground. 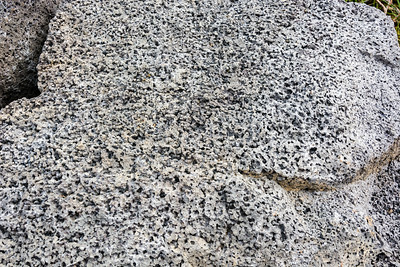 They may be caused by earthquakes or, as in this location, by the drifting apart of the tectonic plates. 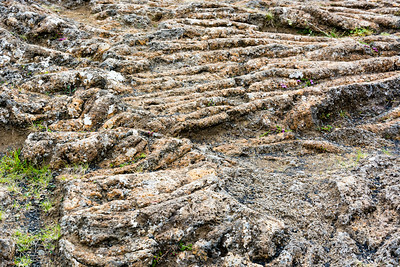 Eventually such cracks get filled in by lava from volcanoes. 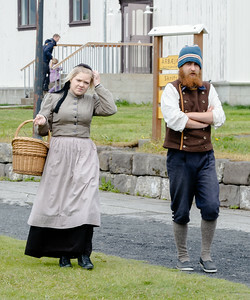 Also known as Reykjavik City Museum, is an open air museum providing a look at early life and culture of Iceland.